This small chip company is betting the third time's a charm. For many years now, small chipmaker Applied Micro (NASDAQ:AMCC) has been vocal about its ARM-based server processor efforts, branded X-Gene. The company's first two generations of X-Gene processors -- X-Gene 1 and X-Gene 2 -- have seen limited adoption by major data centers. However, Applied Micro seems optimistic that its third crack at it -- X-Gene 3 -- will be more successful in the marketplace. According to Applied Micro CEO Paramesh Gopi, the company "successfully taped out" X-Gene 3 in Taiwan Semiconductor Manufacturing Company's (NYSE: TSM) 16-nanometer manufacturing technology last quarter. This means the design was sent off to TSMC to be manufactured. Gopi says that the company still expects that it will ship samples of X-Gene 3 processors to major customers before the end of March. If Applied Micro starts sampling to customers by this coming March, then it would be reasonable to expect volume shipments of the final product to start by March 2018, or about a year after sampling begins. Gopi claims that X-Gene 3 will provide a substantial boost in performance relative to the prior-generation X-Gene 2. "X-Gene 3 is expected to deliver six times the performance of currently shipping X-Gene product," Gopi said. He went on to claim that X-Gene 3 is expected to go head-to-head with server processor market leader Intel's (NASDAQ:INTC) Xeon E5 and Xeon E7 processors "in a similar power [envelope]." According to Gopi, the company is seeing "customer interest" for X-Gene 3 "as it offers socket level performance beyond [Intel Xeon] E5 and E7 class performance coupled with an industry-proven third-generation product family." As far as the potential of X-Gene 3 to move the needle financially, Gopi cautioned that the company isn't expected to see a "big impact" to its revenue until the company's fiscal year 2018 -- a sensible claim, given the time it takes to go from providing product samples to volume shipments of the finalized product. Applied Micro has been talking about its X-Gene family of server processors for about half a decade now. 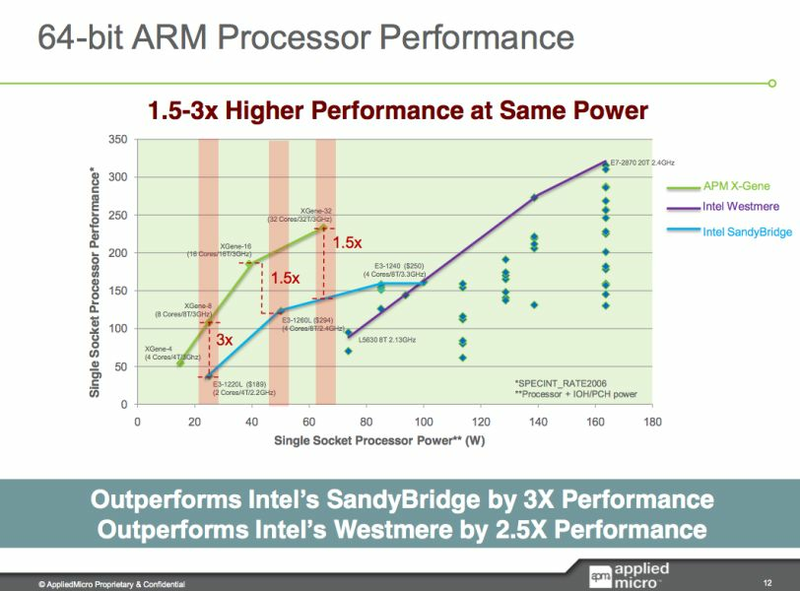 Back in 2011, the company published a slide claiming that X-Gene would outperform Intel's then-current and future server processors by 1.5 to 3 times in comparable power envelopes. The reality is that Applied Micro's X-Gene 1 chip got wrecked by a low-end Intel Atom-based processor that made it to market well before X-Gene 1 did. Indeed, of the $41.78 million in revenue that the company brought in last quarter, only around $11.6 million came from the sale of computing products, including the ARM based X-Gene parts, as well as its embedded PowerPC-based products. Putting this into context, last quarter Intel's data-center platform revenue was $4.164 billion. Intel says that "platforms incorporate various components and technologies, including a microprocessor and chipset, a standalone [system on a chip], or a multichip package." Applied Micro's total computing revenue is what Intel would probably call a rounding error. Considering Applied Micro's track record of overpromising and underdelivering with X-Gene, it might make more sense for investors to take a wait-and-see approach before buying the hype around X-Gene 3.